Christmas is such a lovely and magical time of the year. Everything is decked out, Christmas music is playing everywhere, and there are many gatherings with our cherished friends and family. 1. 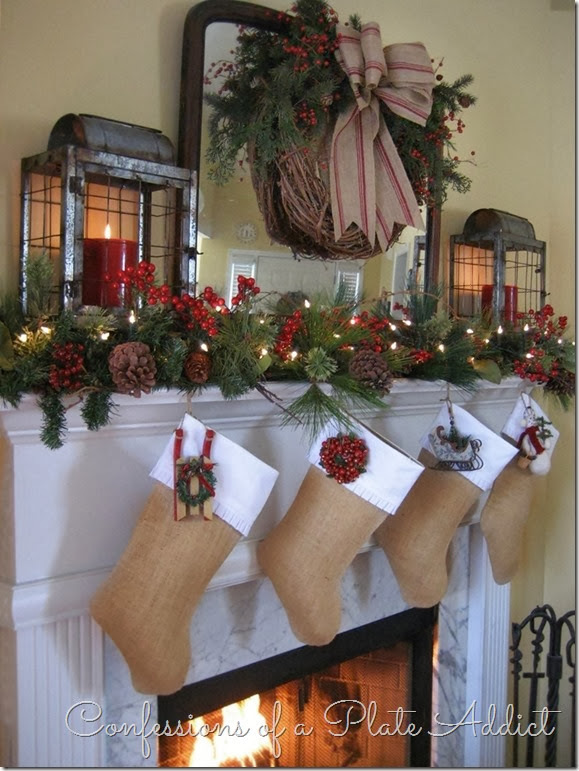 This Farmhouse Christmas Mantel from Confessions Of A Plate Addict is so simple, yet elegant. 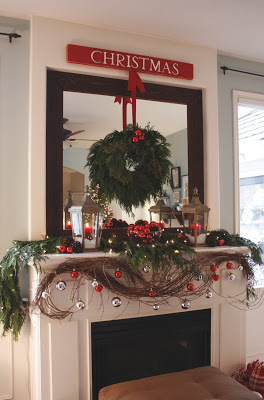 I love the nature-inspired evergreen and pinecones with the lovely wreath above the mantel. Gorgeous! 2. 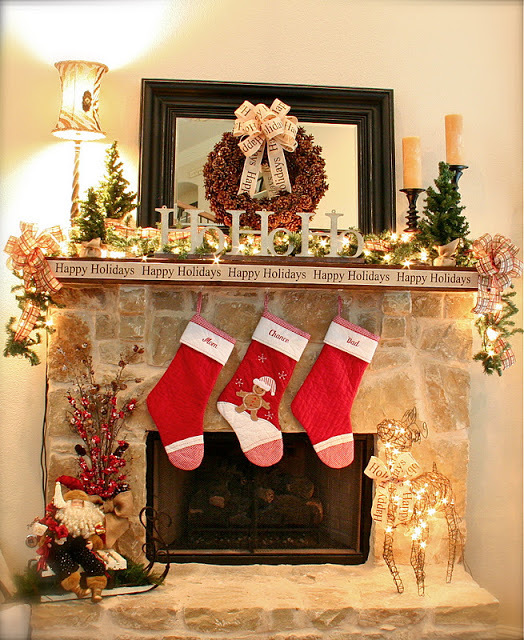 How could you not love this Ho, Ho, Ho Themed Mantel from Lookie What I Did?!?! Check out the particulars on how she created all of the items and would you believe that the Happy Holidays ribbon (from Michael’s) was put up with some double-sided scrapbooking tape? Genius! 3. Now this Bright Red, Green, and White Ornament Themed Mantel found at The Seasonal Home absolutely gets me in the mood for Christmas! Everything about it screams fun, fun, fun! I think my kiddos would absolutely think they had gone to heaven if they woke up and found this kind of mantel waiting for them in the morning! I just LOVE it! 5. What a gorgeous Rustic Greenery and Grapevine Garland Mantel over at Its The Little Things That Make A House A Home! I love how the ornaments are hanging down from the grapevine garland. And the best part of this? 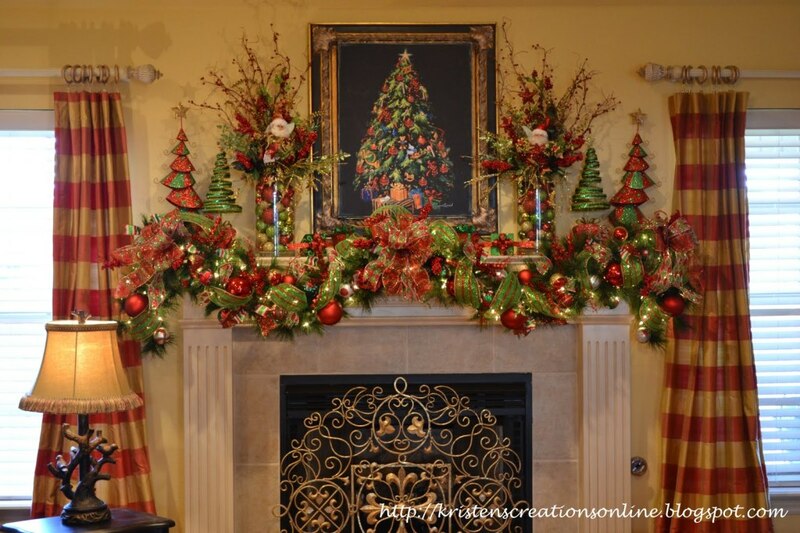 She used this grapevine garland for her Thanksgiving AND Christmas mantel decor! 6. OK. This Sparkly Red and Green Deco Mesh Ribbon Inspired Mantel from Kristens Creations Online is out of this world. I mean… seriously! I’m kind of totally into the whole deco mesh ribbon for just about anything right now and absolutely love the way it works in many types of DIY decorations like wreaths, garland, and even just for those little pops of color in other decor you have around this house. So this deco mesh garland TOTALLY floats my boat! 7. 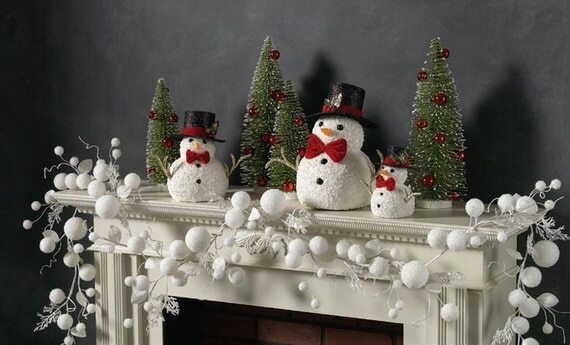 This Snowman Inspired Christmas Mantel found over at Family Holiday is so sweet! 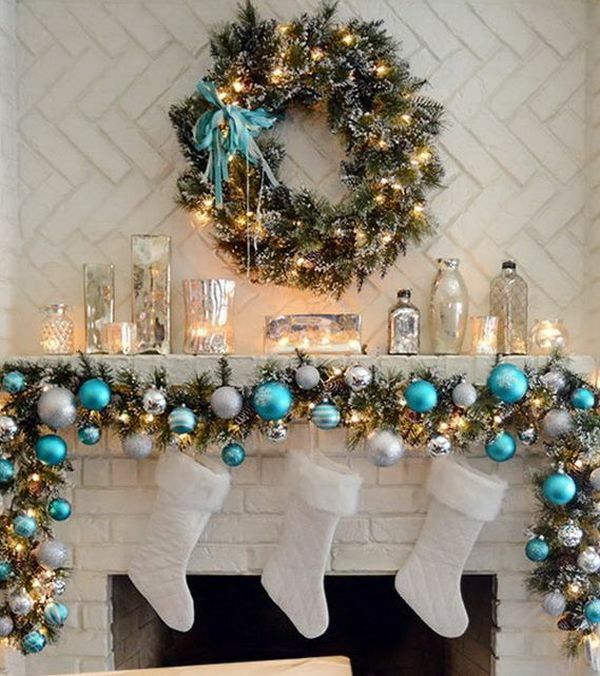 This awesome “snowball” garland looks like a DIY project that is right up my alley. Grab some styrofoam balls, some white crystal paint, and the filler vines, and this could look amazing at your home! How unique! 8. This DIY Rustic Country Burlap Banner Mantel over at SNH Blog is something I have tried with other banners in the past and it has turned out perfect! 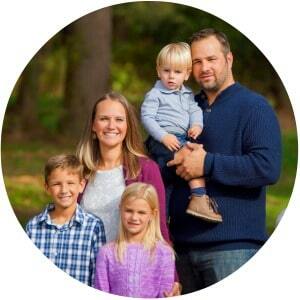 They are so easy to make and I love that you can customize it to say whatever you would want. And the remainder of this rustic country fireplace mantel? Absolutely breathtaking! 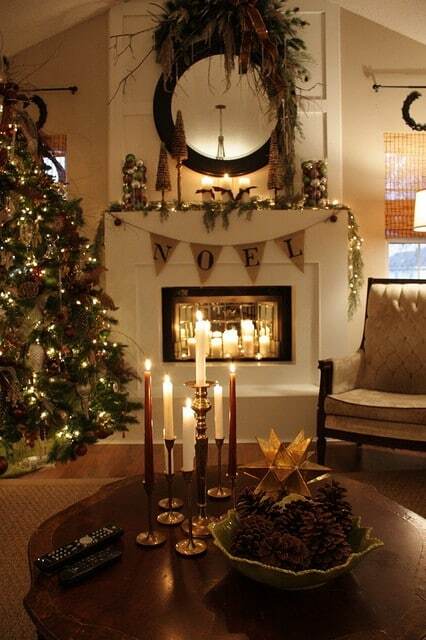 I love the idea of candles in the fireplaces to add a softer, more romantic feel in a room! 9. Fun! 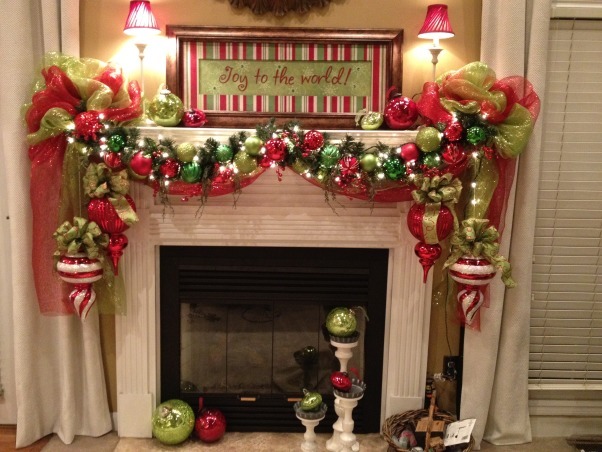 Check out this Joy to the World Mantel with Large Ornaments over at Room Zaar and totally fall in love! Go big or go home! 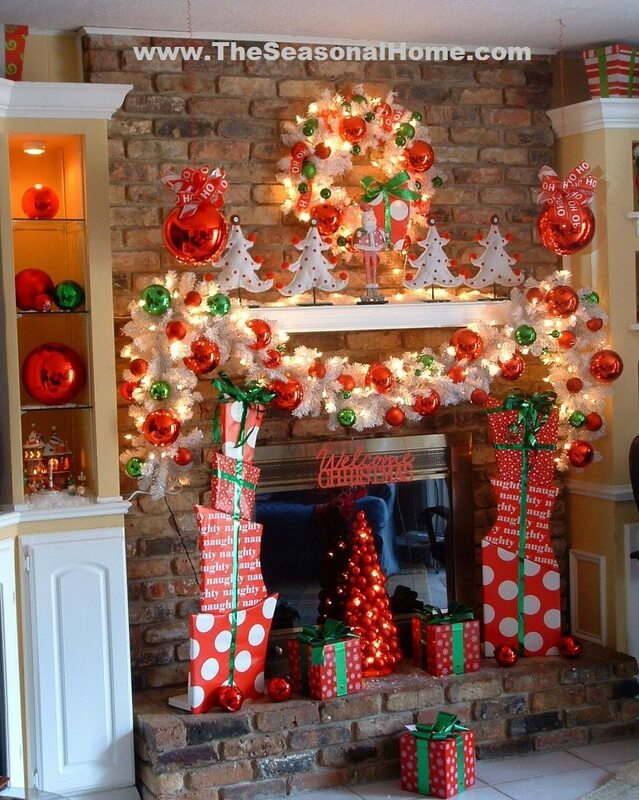 The bright colors and the festive mix of fun, different oversized ornaments screams MERRY CHRISTMAS! I’d love to walk into my home to this every day! 10. Now this is something I totally would have done a few years ago before we had a fireplace! 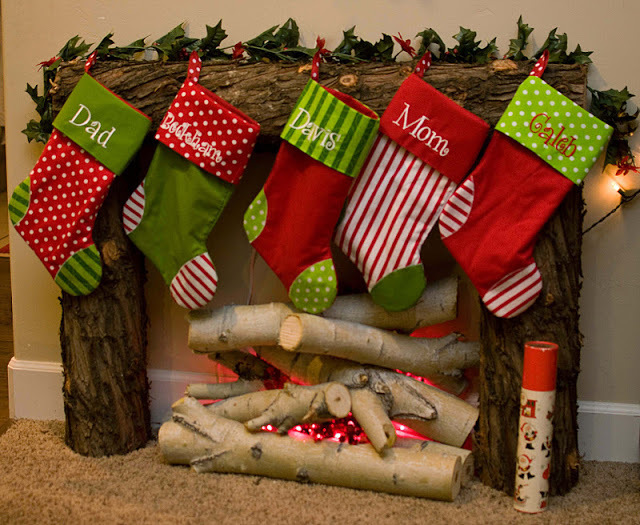 This Fake Fireplace Christmas Mantel found at Over The Big Moon is such a great way to still hang your stockings by the fireplace, without having to worry about not actually having a fireplace! Just think of how much the kids would love this. How creative! I am totally inspired and am a little sad I already have my house all decorated for the holidays. 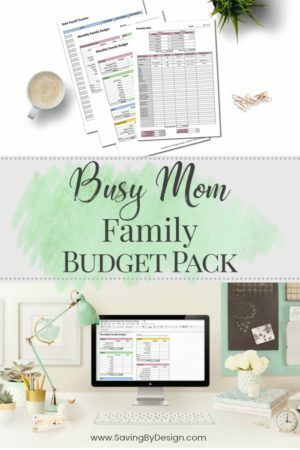 There were so many great ideas here and I want to do them all! But, it’s also a good time of the year to get new ideas, because once those after Christmas sales hit in a few weeks, you can stock up on what you need for your dream Christmas mantel for next year! Yay!